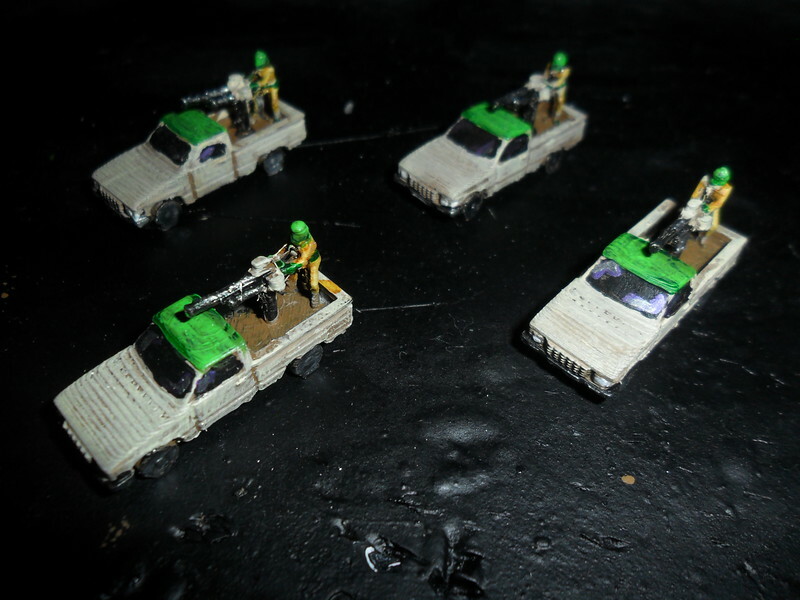 This month, we have something a bit different – the Toyota Hilux Technical, in 144th, suitable for irregular armies. At the moment, we two versions: one with an HMG and one with the Type 63 rocket launcher, both coming in a sprue of four. Shapeways has – for the first time I can recall – sent out cut-off dates for printing if you want is before Christmas. Pertinent to the Shipyards, these dates are for priority shipping (i.e. the most expensive one (of course…!)) and are the 12th of December for white versatile and 10th for the smooth plastic detail. We are currently still parsing through with the infrastructure and pricing and building the catalogue for our direct sales – until that's finally done, contact us through the usual channels and we'll give you a quote! I mention this, since I was otherwise intending to start quoting the direct sales price with new releases. One thing I have discovered thus far is that the prices for quite small models like the Hilux or Iltis (and likely already-released the Wiesel 1) are still better at Shapeways (even after all their mess!) than I can do on the Rep 2 at the moment. 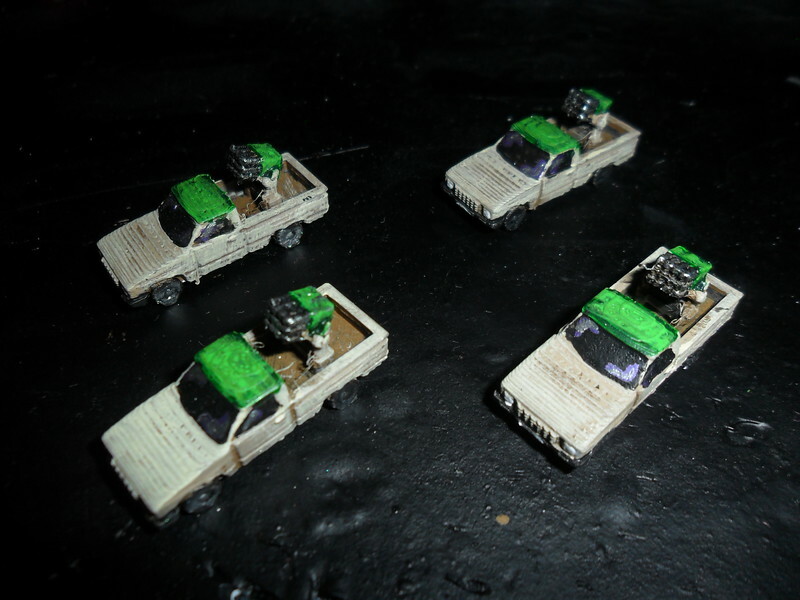 (They can print four models as one; while small stuff, especially with complex geometry like men (like 144th infantry or the man on the Hilux or the unreleased Iltis you may have seen in UshCha's recent thread) is prone to stringing if you do more than one at once (which means more clean-up time).) I will be running some more tests to see what I can do about that shortly. We have a few more models in the pipeline – the Iltis, the Luchs, the GAZ-39731 Vodnik and the first couple of members of the CV(R) family, the Scorpion and the Scimitar, with more on the drawing board. December's release will be from that pool and the other will follow in subsequent months. There will be a sci-fi release later this month, and for once, it may be of more interest to the moderns players (so I'll post it here too), since it is a bit closer to moderns! The Technicals were the first part of a Galactic Terrorists army I'm building for Recon on the 1st December (inspired by a certain computer game which involved giving orders and subjugating, whose colour scheme the Technicals are already in!) The other models in this army are modified versions of existing moderns vehicles such that they can be at the very low end of sci-fi or the cutting edge of ultra-modern! These include the T-72, the Vodnik and the Scorpion. I.e. anything small enough I'd have sprued more than one together as a matter of course anyway.